Are you tired of your short and unattractive eyelashes? The good news in now you can fix the problem without a prescription and without breaking your bank. There are a number of proven lash remedies and enhancement products like mascara, eyelash growth serums, and enhancers such as false eyelashes. Falsies bring instant results and offer a full range of lengths, styles, and colors. Eyelash growth serums offer longer lasting results and have become very popular within the last few years. Trim your eyelashes. This is an optional and helps make your lashes more natural looking. Trim your eyelashes in a way that they’re longer toward the outer corner of the eye. Your eyelash length should also slightly vary. Apply your mascara. 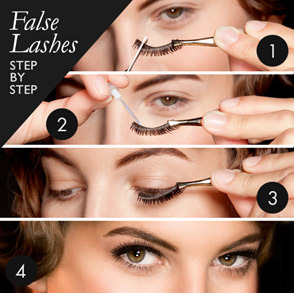 Press your fingers behind the false eyelashes while doing this in order to bond them with your natural lashes. Sometimes it helps to use an eyelash curler before applying mascara. Make sure the materials you use are clean, including the tweezers, mascara, and eyelash curler. This prevents contamination of your eyes. Also wash your eyes if eyelash glue gets into them. Take the falsies off and wash your eyes gently and re-apply after washing. Also beware of glitters in fake lashes that can also get into your eyes and cause eye irritation. For longer lasting lash “grow” you might want to consider using a proven eyelash enhancement product, which normally contain potent herbal extracts and nutrients, as well as needed additives, for helping lengthen, thicken, and improve you overall lash appearance. Keep reading this blog for more eyelash enhancement news and reviews from our expert sources!